This is the power supply unit for operating the mercury-filled Franck-Hertz tube and the neon-filled Franck-Hertz tube. It provides all the voltages needed to power the tubes and includes a sensitive built-in DC amplifier for measuring collector current. 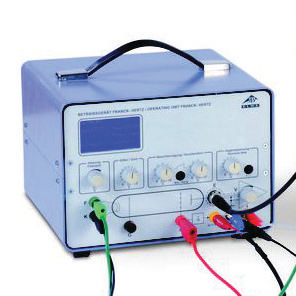 The accelerating voltage can be set-up manually on the apparatus or set to a saw-tooth wave form. Additional measuring inputs are also available for the anode current and accelerating voltage.